Baked chicken and mango tart (S$3.90): these are much smaller and sweeter than they used to be. Maybe it's a dessert now. Note that photos may show more than one serving, as in here. Food is best savoured with friends. So when Ladyironchef rounded up a bunch of us for an impromptu dim sum lunch, I heartily agreed. 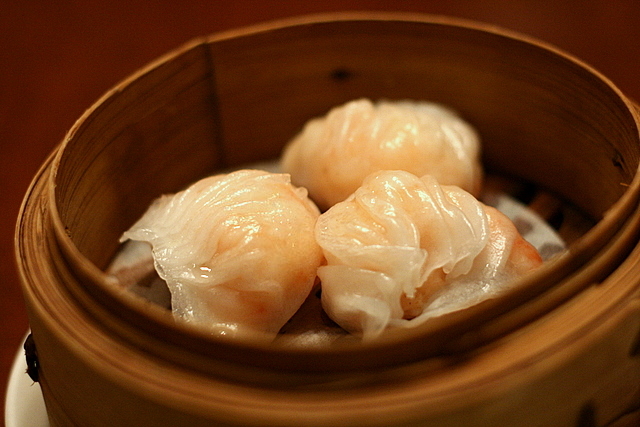 Steamed siew mai with shrimp roe (S$4.80): I remember these used to be HUGE. But they're still tasty with lots of shrimp. 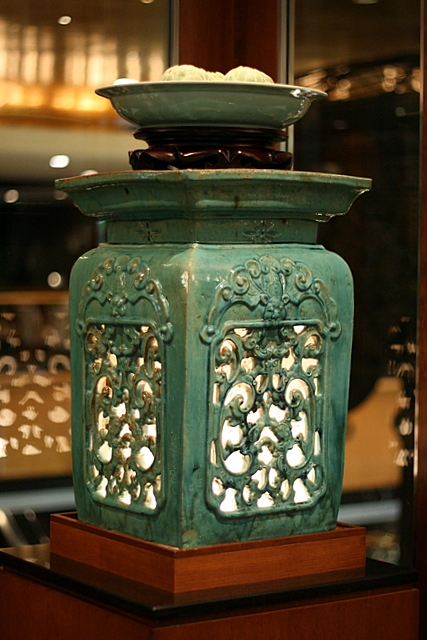 We met at Hua Ting, the Cantonese restaurant in Orchard Hotel. 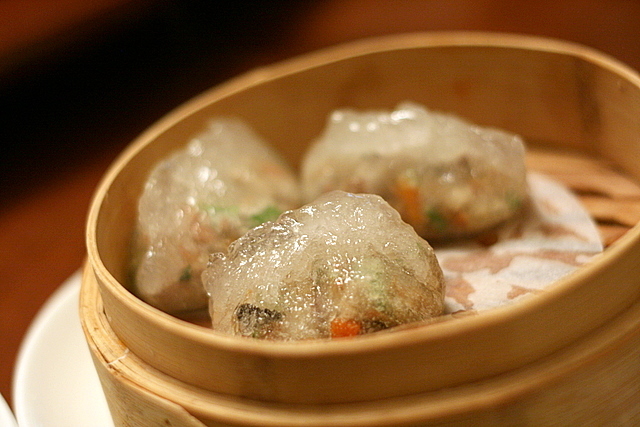 Steamed crystal prawn dumplings (S$4.80): Dainty in size, each dumpling is gone in a mouthful. Most of us have met only once, twice or not at all. But we all know each other from our food blogs. 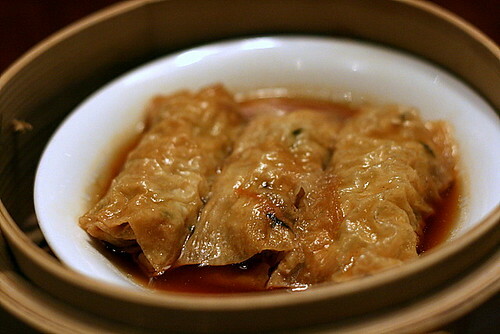 Pan-fried shredded duck rolls (S$4.20): I'm not fond of duck but I liked this. 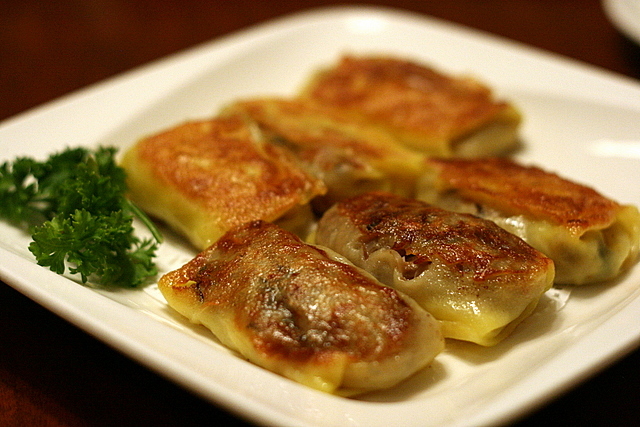 It's got a lot of popiah-like vegetable filling inside. Two servings here, I think. Food makes friends out of strangers. Food makes families bond better. 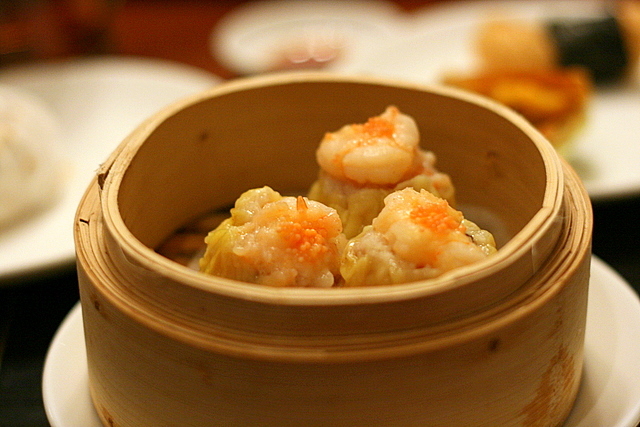 And what better communal food than dim sum? Steamed dumplings Teochew style (S$3.90): the skin is way too thick, sticky and chewy but oddly I thought that was fun. I love sticky, chewy food. The best thing about food bloggers eating together is - guilt-free photo-taking! 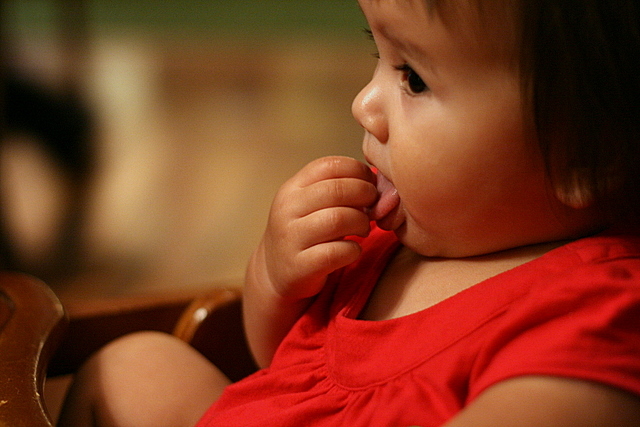 Delayed eating gratification and cold food? We all understand. Completely. Some tea to help with digesting the greasy food. 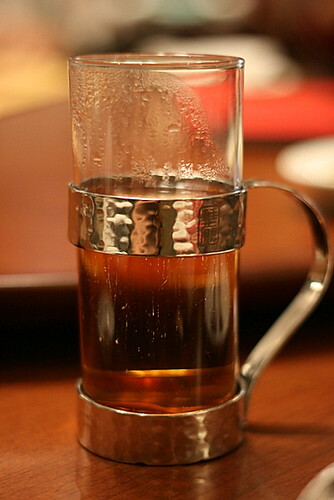 I smiled at the old-school metal holders that Chinese restaurants used to have for hot glasses of tea. Of course, these have been updated with a contemporary look, and Hua Ting's logo. 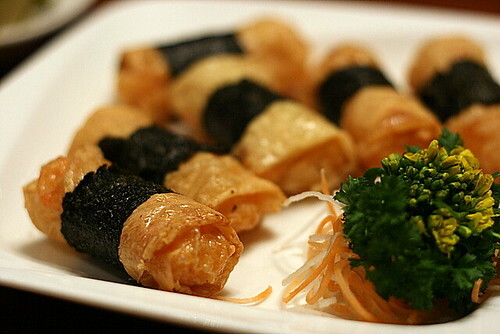 Deep-fried bean skin roll with prawns (S$4.80): certainly a double portion here. One of my favourite items, so I have no complaints. The other fun part about food bloggers eating together is - the different interpretations of food. We get to see how the same food is photographed and reviewed, sometimes very differently. 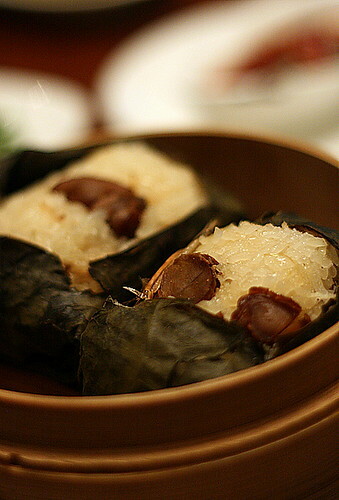 Steamed glutinous rice with abalone (S$5.20): I'm not sure if this was 2 servings. I have never seen abalones so cute and small! We ate, we laughed, we discussed. 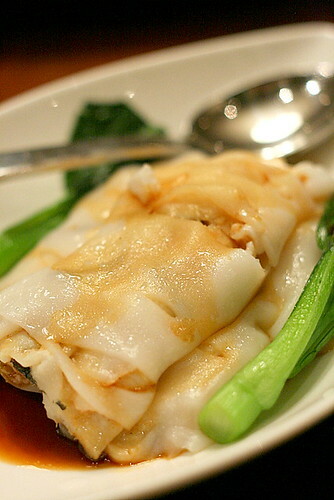 Steamed cheong fan with sliced fish (S$4.80): this is unusual, pairing sliced fish with cheong fan or rice flour rolls. But tastes healthy and good. Great way for kids to eat fish! Oh, and we get to try more dishes with a larger group! The restaurant manager came over to find out who we were, but she was very friendly and handled everything with class. We gave her our cards, and before our meal was over, she had already looked up our blogs. How efficient! Service at Hua Ting in general is faultless. Deep-fried scallop pastry with onion and garlic (S$4.50):The garlic and onion in this overpowered any scallop's hope of exuding flavour. I love garlic but it was a little too strong for me. The pastry was melt-in-the-mouth though. It's my first time using the new 50mm lens for food photography. The new focusing distance took some getting used to. I had to shoot from further away. But in a sense, it was easier as it meant I didn't have to get up from my seat to go close to the food to shoot it. I just took most of it as they passed by on the lazy Susan. And despite knowing it would prove much more strenuous and complicated, I'd brought Jolie along. She's my little dim sum baby, and I wanted her to enjoy some too. But for some reason, she would only eat while on my lap. Oh well, photography will have to take a back seat sometimes. Fortunately Jolie showed no stranger anxiety with this group. She took an instant liking to Hungrycow, who was seated next to her. 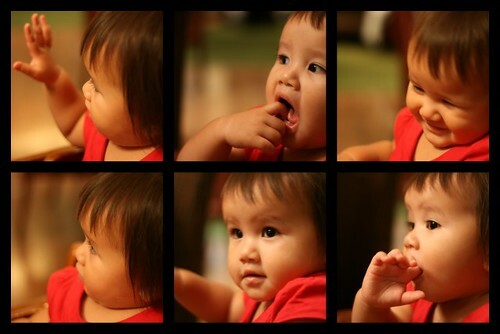 Look at her many faces, playing with him. In all, it was a lovely lunch and we adjourned elsewhere for dessert. 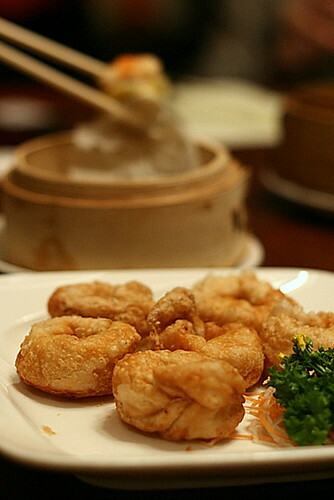 Hua Ting does competent dim sum, but I do think their a la carte dishes are probably the real stars. Check out everyone's blog (when they post), for more complete coverage and alternative views! I actually went out to grab some dimsum in Chinatown after reading your post. Pictures are excellent as always and getting better every time! Jolie seems pretty sociable and well-behaved!...at least when outside. Moo found her cute and entertaining. Haha. Always a pleasure, Dim Sum Queen! your pics are definitely great, despite the fact that u had to juggle between Jolie, the chopsticks and the camera all at once! haha! I can hear the siew mai calling out to me! eat me! eat me! Baked chicken mango tart is shouting to me equally loudly too! shh.. i hear you all. don't shout. i will eat all of you up! line up and take your turn to be eaten! LIC: yes, I know, this post is almost schizophrenic. Part food review, part musing. Yeah, the siew mai is no longer the jumbo mai. D: wow, I'm glad I can have that effect halfway round the planet! Nic: haha, thanks. I need to grow a couple more arms, I know! Great outing indeed. I must also thank you for your chopsticks lifting the dim sum in the background of the scallop pastry shot! I'm back to Paris in France, and I discover your nice blog, unfortunately I forgot my camera and I'm very happy to see your pics, because I had tea and dim sun, yesterday (only for lunch time) at Hua Ting, almost the same as you. 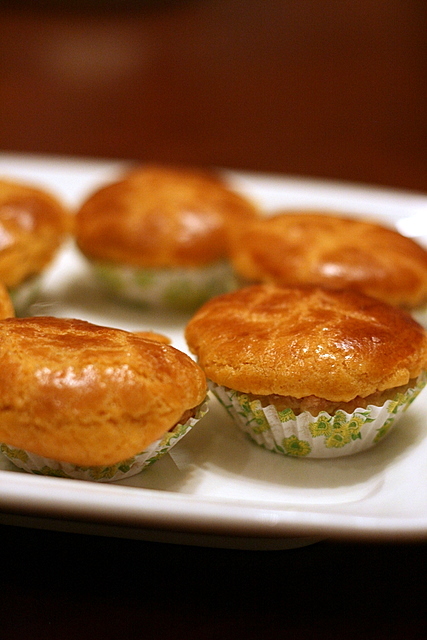 They were very good, I had one, that looks like a fig and filled with soup, but I can remember the name.